Welcome to Bogden Family Dentistry. We are conveniently located in Flemington. Call us to schedule an appointment today! Our team of professionals have worked side by side with Dr. Bogden to create a caring environment that provides quality dental care. We know that dental health is not just about white smiles; it’s about having strong teeth and healthy gums. It’s about maintaining function and comfort throughout your life. Our mission is to help our patients accomplish these goals in a painless, compassionate, and efficient way. Dr. Bogden was born and raised in New Jersey. He has been a dentist in Flemington since 1979, growing his practice from a quaint, two room wood-and-beam structure to the state-of-the-art medical facility you see today. Dr. Bogden first received a BS in Electrical Engineering from Lafayette College in Easton, PA, and went on to receive his Doctorate in Medical Dentistry (DMD) from the University of Medicine and Dentistry of New Jersey, now part of Rutgers University School of Dental Medicine. He then completed his dental residency in Holyoke, Massachusetts, before returning to New Jersey to begin his practice. Dr. Bogden is a member of the New Jersey Dental Association, a lifetime member of the American Dental Association, and a member of the Central New Jersey Dental Society. Dr. Bogden lives with his wife, Beverly, in Raritan Township. He has two (now adult) children, Steven and Kate, who live in New York City and London, respectively. The Bogdens also have a shy but lovable cat named Lola. An avid traveler, in 2006 he and his son climbed Mt. Kilimanjaro in Africa, one of the highest peaks in the world. On his days off you can almost always find Dr. Bogden at Copper Hill playing a round of golf, his favorite pastime. Dr. Brian C. Falk, D.D.S., M.S. Dr. Brian Falk, a native to New Jersey, grew up in Mendham and attended West Morris Mendham High School. He received his BS from Boston University and an MS in Biomedical Science from Rutgers School of Biomedical Sciences. Dr. Falk earned his degree in Doctor of Dental Surgery (D.D.S.) from the University of Maryland School of Dentistry. During his time in dental school, Dr. Falk completed an externship program at the Philadelphia VA as well as donated his services to various volunteer programs, including Give Kids a Smile. He then chose to complete a general practice residency program at Robert Wood Johnson University Hospital in New Brunswick, NJ. Dr. Falk will be continuing his training by studying implantology at New York University. Dr. Falk is an active member of the American Dental Association, New Jersey Dental Association, and Middlesex County Dental Society. Dr. Falk enjoys traveling, spending time at the Jersey shore, playing ice hockey or a round of golf at his favorite courses. Dr. Falk looks forward to meeting you and providing a pleasant and comfortable dental experience. Kim is our office manager and joined our practice in 1986. She has her NJ Dental X-ray License and is a Registered Dental Assistant. Kim has extensive knowledge in the administrative aspect of our practice and is responsible for making sure our office runs smoothly and efficiently. She coordinates our patients’ financial agreements, billing and maximizing insurance benefits, scheduling appointments and presenting treatment plans. Her smile is one of the first things you will see when you arrive at our office. Kim is always available to help our patients. Sherri comes to our office with over 35 years of experience working in the dental field. She grew up locally, was trained as a dental assistant, and has been enjoying the administrative side of dentistry. Sherri is very knowledgeable in dental procedures and will be happy to answer any questions you may have about your treatment. She also will be happy to help you maximize your insurance benefits, answer any billing questions you may have, and will schedule your appointments accordingly. Lynn pursued her career in dental hygiene at Forsyth School for Dental Hygienists at Northeastern University in Boston, MA. After graduation, she returned to Hunterdon County where she has gained over 30 years’ experience in the NJ and PA area. She has been with our office for nearly 25 years and has enjoyed getting to know many patients and seeing their families grow through the years. Through continuing education she keeps current with new technology and techniques. Although she has seen many changes in dentistry, her favorite area remains working with patients to achieve an overall healthy smile. Lynn is the OSHA coordinator for the office and keeps us current with all OSHA regulations. Sue started as a dental assistant and then decided to pursue a career in dental hygiene. She has over 38 years experience in the dental field. She graduated from Union County College in New Jersey and continued to get her advanced certificate in dental hygiene from UMDNJ-SHRP. Sue has worked in the past as an adjunct clinical faculty member at UMDNJ-SHRP where she taught dental hygiene students all aspects of patient care. Sue is a very insightful and understanding person who pays attention to detail. She has a great passion for hygiene and strives to educate patients of all ages about proper homecare to ensure good oral health. Debbie has been a dental assistant since 1980. She was inspired by her orthodontist to seek out a role in dental education. She is a graduate of Morris County Community College's accredited program for Registered Dental Assistants and holds a NJ Dental X-ray License. She also has her group teaching certificate in early childhood education. With seven years of preschool education under her belt she is great with our younger patients. Debbie is compassionate and understands a patients needs when they are in the chair. She has an extensive knowledge in dentistry and can easily explain procedures to apprehensive patients, if need be. She also helps out with our social presence on the internet. She enjoys bringing technology into our office. Karen is a graduate of Warren County Community Colleges Dental Assisting and Radiology Program. She is NELDA Certified through the Dental Assisting National Board, and holds a current X-ray License. 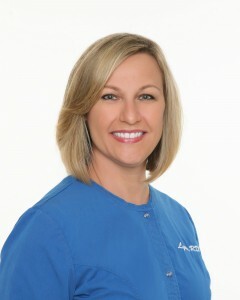 Karen has extensive knowledge in sterilization and disinfection. She is compassionate with all of our patients. Working chair-side with Dr. Bogden she makes patients feel as comfortable as possible, preparing them for treatment, and obtaining and charting their dental records. Karen really enjoys seeing our patients through the restorative process, watching someones smile get transformed to something they can show off makes her day.